Happy Arbor Day — April 26, 2013! I’m not sure what it is with trees. Perhaps for people who live with oaks and elms and maples, their shade in the summer, their vibrant colors in the autumn, their announcement of rebirth in the spring and their bareness in winter, all of these changes mark our lives from year to year. 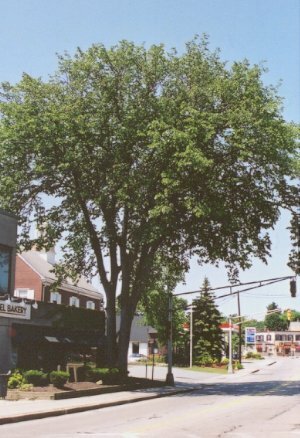 Sadly, the town where I spent part of my life (moving from being a pre-teen into a young adult), the elm trees that bordered our streets were later removed due to what is known as Dutch elm disease. This happened after my family left, and when I visited some years later, the town streets didn’t look the same. While it wasn’t completely barren, the removal of the trees took away a certain warmth and beauty. Maybe this is when I first realized the value of a tree. Here’s to the elm tree in all its Midwestern glory.